Next up, the Reds travel to the Estádio do Dragão on Wednesday with a 2-0 advantage over Porto before a trip to relegation-threatened Cardiff on Sunday. Externally, we’ve been surrounded by noise and doubts about our ability to hold our nerve against Manchester City, but Jürgen and the boys are focusing solely on their own business. “Today, they [City] win and [did it] ask a question for us? If we think about them, yes, and if we don’t think about them, no”, Klopp bluntly stated. “We play our game. If, for example, City lose today and we know it five minutes before our game, somebody tells us, ‘City lost’, that’s not a help. Then you lose your focus in that moment. “What we want to do is collect as many points as possible, really. 85 points, four games to play, that means [we can get] 97. Good, let’s try. Let’s try that. If that’s enough, perfect, and if not, we cannot change it. The boss’ measured response is a welcome panacea to the doom merchants and naysayers. This City side are one of the best teams ever to grace the Premier League, but we’re not too bad ourselves and the fact we keep pushing them right to the edge is a testament to our own greatness. 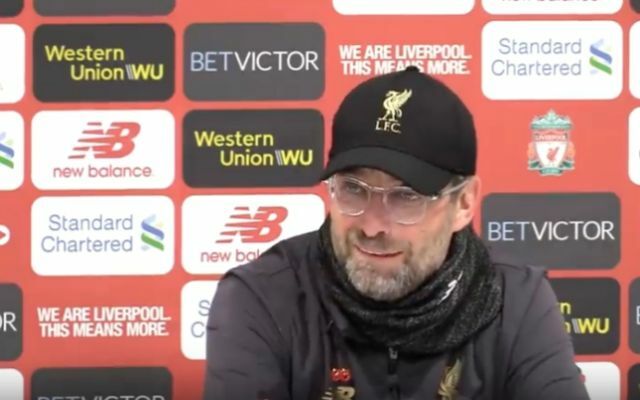 Klopp aimed further shots at the media and the world of punditry by stating that: “We didn’t lose it here or there or in this or that game. Thankfully, any concerns that history would repeat itself were quickly extinguished when Gonzalo Higuaín took possession and the move broke down. Klopp and the whole of Anfield exultantly revelled in it. That’s all we can do – go for it against Porto and try and fight for league wins against Cardiff, Huddersfield, Newcastle, and Wolves. Get past Porto and we’ll have a semi-final tie where we’ll likely face Barcelona.